As I’ve mentioned before, I’ve needed some tools to keep me motivated and on track on this quest for a healthier me. To keep me motivated from an activity standpoint, I’ve turned to the trusty pedometer…not your old school variety that you can often obtain for free with various group health/walking programs. I’ve taken to using a “smart” pedometer. What makes a pedometer “smart” you might be wondering – generally they utilize accelerometers and sometimes even altimeters to calculate your steps taken and stairs climbed – they typically interface with a computer program of some sort to give you graphs and statistics. The two that I’ve used also pair with other apps to allow for some social competition and caloric tracking. First, the older of the two: The Fitbit Classic – the Classic is the first generation Fitbit. The current model is slightly redesigned, comes in two colors, has similar outputs, and the web-interface is the same (as far as I can tell). My fitbit does not have the capability of counting stairs, and it is not wireless – both features found on the current model of Fitbit: the Fitbit One. I got my fitbit when they first launched, at the end of 2009. The fitbit tracks steps, stairs, distance traveled, activity level and sleep – it also estimates caloric burn (total including your base metabolic calories). All of this data is available via their web interface, and also via their smartphone app (which I have not used). The site (and the app) also allow you to log your foods, so you can work on keeping a caloric intake/burn balance or deficit (depending on your fitness goals). Use of the general web dashboard and app are free, though users can opt-in for premium membership to gain access to additional statistics and graphs in addition to having a personalized 12-week fitness plan created. If you have friends that also use fitbit, you can connect with them via your fitbit account and compete/support each other. Fitbit also integrates with other popular apps such as Lose it! and My Fitness Pal amongst a host of others. One of my favorite partner apps is Earned It – it uses the data collected off the Fitbit to calculate points that can be redeemed against a variety of prizes OR they can be used to generate a charitable contribution to several organizations. As far as motivation goes, if you don’t have anyone connected via your fitbit network, the fitbit’s on-board activity level estimator is a flower icon that grows or shrinks with your activity level – the idea is to stay active to grow your flower to have more leaves. 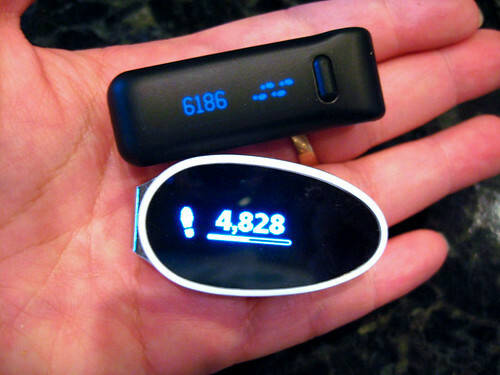 Enough about the Fitbit…the other smart pedometer I’ve been using is the new Striiv Play from Striiv. 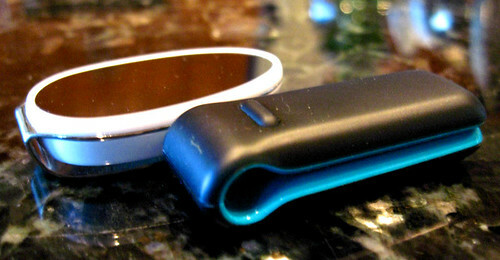 The Striiv Play is about the same size as the Fitbit, but instead of talking to my computer, it talks to my phone – the Play is only compatible at this time with newer iOS devices iphone 4S, iphone 5, the newest iPad/ipod Touch and iPad Mini (this is because it utilizes Bluetooth 4.0 to connect to the device). The Play itself tracks and records steps, stairs, distance traveled, calories burned (strictly from walking), and minutes of activity. It also reports number of “trophies” earned in a day – based on milestones created by the iOS app. Because the Striiv Play links with a mobile device rather than a full blown computer, the charts are much more simplified. Rather than providing detail by minute/hour the app only provides a day to day summary. The large A (and associated dashed line) indicates your average over multiple days (it uses all days of data available to it to calculate the average without taking into account 0 activity days when you may have forgotten to wear your pedometer). The Star (and its associated line) marks your best day to date. Like the Fitbit, you can check your current stats on the device itself. Unlike the Fitbit, the Striiv App does not allow for food tracking, though like the fitbit, the Striiv app is partnered with MyFitnessPal and users can use that app to track foods. The Striiv app + Play combo also allows you to invite your friends to compete against. Friends can be invited via email or via Facebook (though it seems for the leaderboard to work on the app, you need to login using your facebook account rather than using a striiv account). If you don’t happen to have any friends that also use the Striiv App, the app itself has some challenges built in to try to help you get more activity into your day. In addition, it has a game called “My Land” (similar to Farmville) that is played by earning energy by achieving milestones and completing challenges set forth in the app. 1) Battery Life: Fitbit lasts longer, requiring a charge every 5-7 days or so. My Striiv play seems to only last 3-4 days (closer to three). I did take the striiv on a hike on a full charge and found it dead well before the end of the day. The hike was relatively short, less than 10 miles. I’ve contacted Striiv customer service to find out more about what I should be expecting for battery life. 2) Display: the Striiv Play is much brighter and easier to read in bright sun. The glossy finish on the Play does tend to attract fingerprints though. 3) Accuracy of Step Count: Hard to say here – both are much better than an old-school mechanical Pedometer. The fitbit occasionally counts movement while driving, the Striiv Play sometimes seems to lag and requires a several steps for it to realize I’m walking. 4) Accuracy of Stair Count: My Fitbit is one that is old enough that it did not have the stair counting ability, so I can’t comment on the Fitbit’s performance. The Striiv Play definitely counts stairs, though it seems it can sometimes be tricked into counting stairs when no stairs are present. As expected, it will estimate stairs for elevation gains on hilly walks, but I found it also registered stair climbs while walking on a treadmill on an upper story of my gym. I’ve been given to believe that the Striiv Play altimeter is sensitive to barometric changes, so I suspect wacky weather can also affect staircount. 5) Accuracy of distance Traveled: Distance Traveled is an estimate based on calculations done by the fitbit/striiv devices. The Fitbit seems to use a fairly straightforward #steps x step length calculation while the striiv makes adjustments to its estimated distance traveled based on step pace (lengthens or shortens the estimated step length based on step pace). I haven’t had a chance to carry them both on a pre-determined route to benchmark the accuracy. 6) Data and Graphs: Fitbit definitely wins as far as a data output standpoint. I can review up to one year’s worth of data on the Fitbit dashboard online. Each day shows my activity with a graph like the one above, so it’s possible to correlate activity with my daily routines and schedule. Members of the Fitbit Premium service have access to even better charts and statistics and can also export their data. 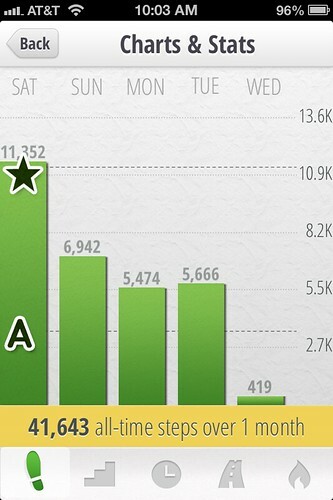 The Striiv App charts are very rudimentary and alternate between a 5 day and 30-day view. At this time it is not possible to view further data on the computer or for different time frames. 7) Synchronizing: My Classic Fitbit synchronizes with no problem as soon as i’m in range of the base and the computer it is docked to. The Striiv Play can be a bit fussy and often times requires me to open the app on my phone then wake the Striiv Play to trigger the bluetooth link. 8) Motivators: Both offer Badges/Trophies for milestones. Both offer an aspect of competition with friends. Through EarnedIt, I can earn money for charities by using my Fitbit. While the Striiv Smart Pedometer has something similar built in (called Walkathons), this charitable giving option is not available for Striiv Play or the App. As for which device has actually gotten me to be more active? I’d have to give that one to the Striiv Play + App combo. When popping in to collect my coins on MyLand, I will often check the current challenge, and it will usually spur me to get up and move. I have no idea how long this will last, because eventually MyLand will be all built out, but Striiv indicates they will be continuing to develop the app, and presumably the interface(s) with the device itself. 9) Price: Fitbit One (current model as of this writing) retails for $99.95. Fitbit also makes the Zip (does not track stairs, uses a replaceable watch battery rather than being a rechargable device) retailing at $59.95. The Striiv Play retails at $69.96 but can be had for $59.95 at Amazon. I’m not sure how much longer I’ll be keeping my Striiv Play – it may well be back on its way back to the place that I bought it because it’s proving to be a bit finicky. While I very much like the idea of it, and I like the motivators, I’ve found the shorter battery life (relative to the fitbit) to be an annoyance. I’ve had it die on me several times and the battery life indicators of “half-full” and “low” to be rather vague – unplugging the device from its charging cable will usually give a battery % status which is much more helpful. In addition, the Bluetooth connectivity to my phone seems to be finicky, even with the initial software “upgrades” pushed to the device. There have been occasions where I can’t get the phone and the Striiv to talk to each other at all, and other times when it seems to take while before they acknowledge one another. I have also noticed that on occasion, I can pace the entire length of my office building with the Play in my pocket and it doesn’t register a single step. Once it realizes I’m walking, it will count along nicely, but there are times where it seems it’s trying to decide if I’m moving around legitimately or not. I’ll give it another few days, but I’m likely looking at a return. I took the striiv play out for another longish hike this weekend (about 10 miles, with lots of elevation gain) – this time, it seems the battery only drained about halfway during the course of the hike – I’m still finding I have to charge the striiv play about every third day. Haven’t had any recent major hiccups with the Bluetooth sync – it still takes a bit, but it seems to trigger a handshake whenever I launch the app on my phone without my having to wake the Play as well. I’m officially back on the fence on this device/app pairing. Striiv Play is definitely being returned. I’ve had it die on me again, and it seems confused with regards to the charge. Battery has reported depleted to 50% charge in the course of less than a day several days in a row. When I plug the Play in to charge, I can charge it until it says it is full, unplug it, then plug it back in and then it reports it is at half-full while at the same time it reports itself at 100% on unplugging again. It seems Striiv is still working out the bugs, but I’ve lost patience with it. Thanks for your comments. I just accidentally flushed my Fitbit Ultra down the toilet last night. I’d been wearing for most of the year and just loved it. When I found out about Striiv I wanted to learn more before I replace my fitbit. I love the concept of Striiv. I downloaded the app and have been playing around on it. Striiv is alot of fun and the challenges really do get you moving. I fear from what you and others have written that this device will have to evolve a bit before it becomes stable with appropriate battery life. While not as fun, I know the fitbit will be reliable and deliver to me the data I’m looking for. Thanks again for sharing your experience with these devices. Thank you for reading! I’ve been contemplating getting a Fitbit One of late…the syncing to my phone would be nice, but I haven’t been terribly thrilled with the Fitbit App. I do hope that Striiv manages to get the bugs worked out, their device is fun, but the short battery life and the fussiness with the synch really need to be resolved first. Hi Stephanie, I think I’m going to stick with fitbit for now and keep an eye on what Striiv comes up with. I thought I’d mention to you that you can link your fitbit to this site to work toward rewards and charitable donations. This gives the fitbit some of the striiv type motivation. This site is earndit.com and it’s free to register. Paul, thanks for the heads up 🙂 I’d discovered earnedit and have linked my fitbit. Another site/app that works with fitbit to earn rewards is everymove.org – unfortunately it looks like their app is iphone only at this time – also free to register. I’ll check that site out. Still on the fence. I’m tempted to try Striiv. I’ve been using the iPhone app all week with GPS tracking. It’s been accurate and I’ve tripled my usual office job activity level because of all the little challenges. For me it’s getting me out of my chair but fitbit really only just told me what I did. I might keep using the app of a bit before I decide. Can you tell me, with the play did you get access to the ‘my Striiv page with the dail stats and all time stats? Without a Striiv device (just iPhone) it doesn’t show any stats. For the full size strive it shows it on te feature page but no mention of it on the play product page. The stats were extremely basic and only available on the phone. An example of the daily steps graph is shown above in the post. Basically you get a bar chart with the full day totals. Nothing web based, though they might be developing something as they indicated they were trying to converge and grow the play and the original Striiv Smart Pedometer and move them forward together. Fitbit stats were much more detailed, but definitely lacked any sort of reminder or challenge to get up and move more. The other device you might consider is the Jawbone Up – it was redesigned and relaunched this fall, and I’ve read good things about it, though it does not synch via bluetooth. I understand it actually will vibrate on your wrist to give you a reminder to get up and move if it deems you’ve been sedentary for too long. I’ll checkout the Jawbone. I do want a sync to my fitness pal on whatever I get. I’m holding off right now because fitbit might give me a new one under warranty. I think it’s pretty cool they’re even considering it. i didnt break it I lost it. They wanted my receipt, shiping address and preferred colour. Sounds promising. If they replace it just because I lost it then that is some great support. I do use the fitbit scale too, Aria. It’s pretty great and it’s data syncs back into fitness pal as well. I’ve heard fantastic things about fitbit customer service even when it comes to lost fitbits. Jawbone doesn’t sync to MyFitnessPal that I am aware of. Hope to hear you get a replacement fitbit soon! Happy Holidays! I’m glad you found my writeup helpful! I’m currently carrying around a Zip. Sadly, no stair tracking (and I never did use the sleep tracking) – so far so good…. Just to chime in… I have the original Striiv Smart Pedometer and have owned it for almost a year. I got it before the Striiv Play was introduced. The original partners with Global giving and automatically donates either water for a child in South America, a polio vaccine, or conserves a portion of rainforest for a year as you earn it. I’ve stuck to the Clean water one and have earned 292 days worth of water so far. The challenges and MyLand motivators still keep me motivated, though slightly less than they used to. I’ve dropped my Striiv in water twice and it still keeps ticking. I have no issues with battery life; it lasts for 4 or 5 days depending on activity. A few of my friends have Fitbits and keep trying to convince me to switch over, but so far, I can’t find a reason to except size. I love my Striiv Smart Pedometer. All of that being said, I’ve also heard that the Play can be flaky. I imagine that once they get the bugs worked out, the Play will be a fierce competitor to the Fitbit. I’ve had 3 Fitbits (Ultra and 2 Fitbit Ones). The Ultra and one of the Ones went through the washer and i lost the other one. I won’t buy another – they’re far too easy to lose. So I bought a Striiv Play and it seems to be ok. Nothing fancy but it works for me. I also have a Nike Shoe sensor. It works but I have difficulty getting it to calibrate. All in all, I think I’ll stick with the Play, even though it could use some refinements, which I hope we’ll see in the near future. Thank you for your review Strphanie & thanks to everyone else who has commented here. I am considering getting one of these devices to get an accurate monitor of my activity levels. I have restricted mobility and most pedometers I have used under-count because they wait for around 10 steps or so to make sure you are genuinely moving and haven’t just knocked it off the table etc. I’ve tried using phone apps for an accurate count but some also count car journeys.